Head along the N7 in the direction of Springbok. Pass Garies and continue for approximately 28km to the Kammieskroon turnoff. Turn right into Kammieskroon from the N7, after about 500m you will get to a t-junction, turn left here. Continue onto a gravel road which passes underneath the N7 in a westerly direction. 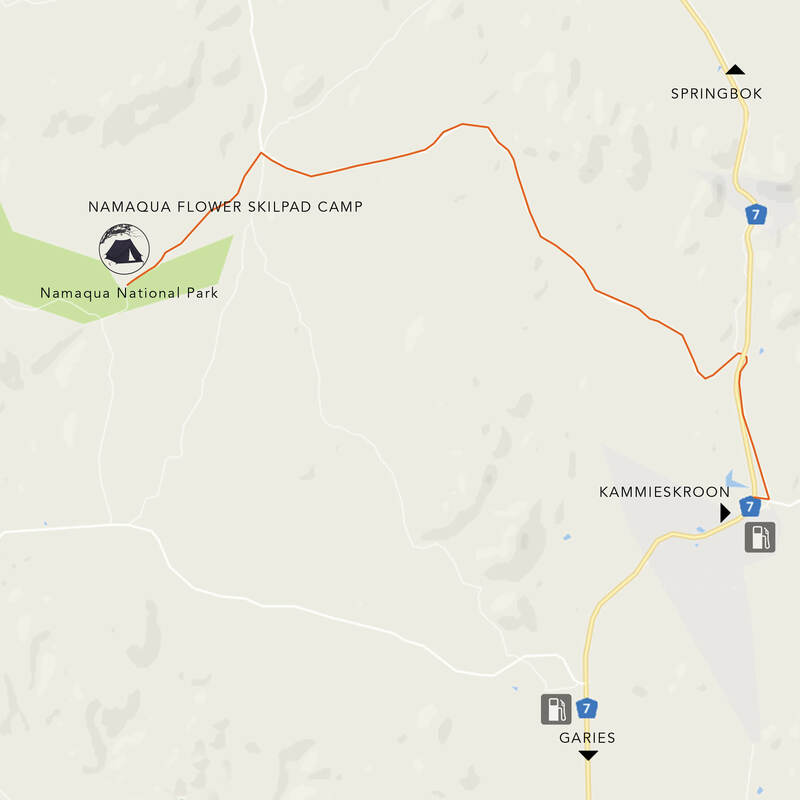 Turn right here and follow the Namaqua Flower Skilpad Signage to camp. Head along the N7 in the direction of Cape Town. Continue for approximately 70km until you reach the Kammieskroon turnoff. Turn left off the N7 towards Kammieskroon. After about 500m you will get to a t-junction, turn left here. Continue onto a gravel road which passes underneath the N7 in a westerly direction. Head along the N7 in the direction of Springbok. Pass Bitterfontein on your left and continue for approximately 38km. Look out for the Groenrivier sign and turn left at the sign onto a gravel road. Continue for approximately 11km (perhaps encountering a closed farm gate – simply open, pass through and close the gate behind you). At the T-Junction turn right and continue approximately 300m before turning sharply left. Travel for approximately 50km. You will pass a purple farm building on your left. 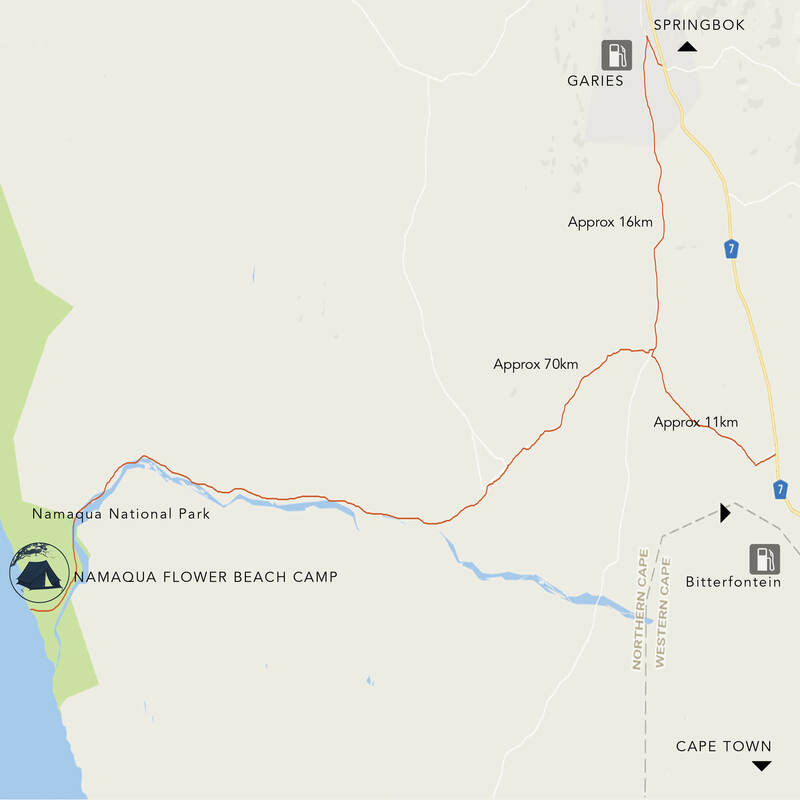 After leaving the office travel up the hill and continue for approximately 1km where you will find Namaqua Flower Beach Camp on your left. Head along the N7 in the direction of Cape Town. 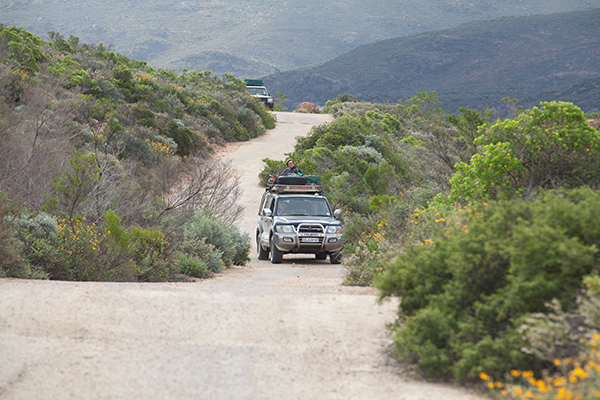 Continue for approximately 120km until you reach the Garies turnoff. Turn right off the N7 towards Garies. After about 100m you will get to a t-junction, turn left here. Continue to the t-junction (Agrimark and garage on your left). Turn left and head up the Main road until you come to the Groenrivier road on your right. Turn right onto this gravel road. in the road – slip right and continue straight towards Groenrivier. Do not turn left. Follow steps 3, 4 and 5 opposite.